Not too far from a cacophonously noisy construction site in Hadapsar, more than 60 boys and girls are busy learning mathematical tables, days of the week, colours and the importance of not cutting trees. The kids, all children of construction labourers, are housed in three roughly constructed rooms that are filled with books, charts, craft material and cognitive games and puzzles. To guide them are trained social workers and enthusiastic volunteers who are trying their best to give them a bright future. Mobile schools, camps and crèches like this one provide children with everything: access to swings, toys, books, computers, nutritious food, timely health checks and vaccinations. Above all, they give them asafe abode while their parents go to work. Today, there are about 200 such schools operating from 2500+ construction sites in the city. While the day-to-day work is managed by NGOs, such mobile camps have the backing of the Pune Municipal Corporation and Credai, an association of builders, which provides not just space but also basic facilities like water and sanitation. Nisha Mehta, director of Tara Mobile Creches, an NGO, says, “These children, from newborns to those in high school, colleges or even higher, may be as bright or intelligent as any other kid. But they lack vision, opportunities and funding.” Tara Mobile Crèches runs 16 such camps in Pune, Chakan and neighbouring Lavasa. Mehta said that migrant labourers leave behind their children with them while they work in hazardous conditions at construction sites. “We not only feed them a nutritionist-recommended diet, but also ensure regular health check ups and vaccinations, besides providing them basic non-formal education, computer classes, life lessons and teach them healthy every day habits like washing hands, to prepare them for entry into mainstream schools and colleges,” said Mehta. Children enrolled in nearby schools usually come to the camps in shifts and are helped with their homework and school-related activities. Funds for their activities are usually generated by the NGOs themselves though a part of it can also come from builders and volunteers, besides government schemes and philanthropic wings of the corporate sector. Children enjoy their time here as is evident from high attendance at the camp, which they call their home. “I like coming here because I get to play, eat and even finish my homework properly. The madam has also told me to wash my hands before I eat food,” says nine-yearold Harinath. Labourers, who leave their children with the NGOs, not only appreciate the security provided, but are also content with the kind of exposure their children get. “I leave my 6-year-old daughter and 4-year-old son here every day in the morning. They eat on time, learn new things, and are looked after well. Both narrate their day’s experiences when I come to collect them in the evening,” said construction labourer Mohan Kushardevdekar. Doorstep School, which works for educating children living at construction sites and slums, conducts pre-primary classes for children in 3-6 age group. Besides it conducts literacy classes for children who don’t attend mainstream schools. “The non-enrolment rate of children of migrant parents and those living in unauthorised slums is more. 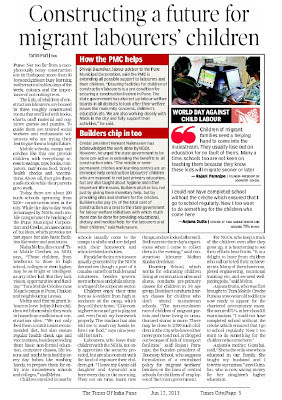 There may be close to 2,700 such children in the city, who have either never gone to school, or dropped out because of lack of transport facilities,” said Rajani Paranjpe, the founder- president of Doorstep School, who suggests formulation of a centralised policy for migrant workers’ families on the lines of central schools for children of employees of the Union government. For NGOs, who keep a track of the children even after they grow up, it is heartening to see their efforts bear fruits. “It is a delight to hear from children who call us to tell their achievements. Many of them have completed engineering, vocational training etc, and secured wellpaying jobs,” said Mehta. Anjana’s mother, Gunabai, said, “She is the only one who is educated in our family. She taught my husband and I to write our names,” says Gunabai, who is now saving money for her daughter’s higher education. 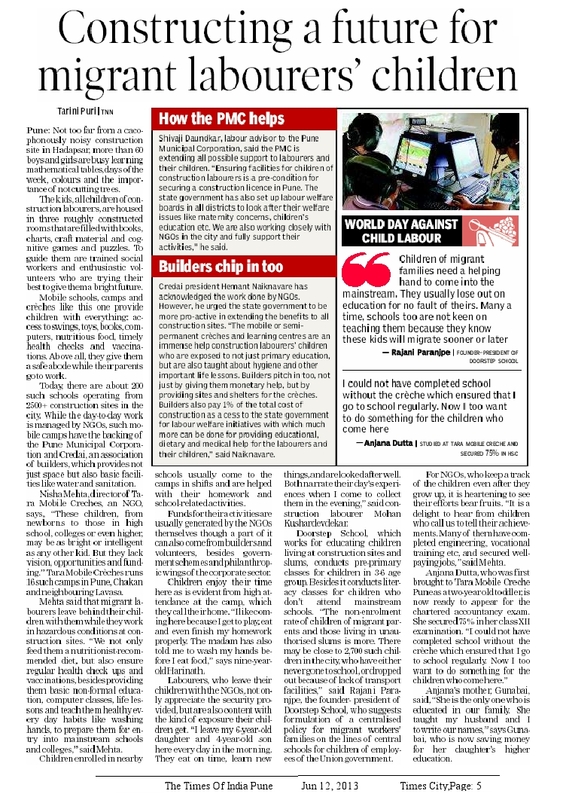 Shivaji Daundkar, labour advisor to the Pune Municipal Corporation, said the PMC is extending all possible support to labourers and their children. “Ensuring facilities for children of construction labourers is a pre-condition for securing a construction licence in Pune. The state government has also set up labour welfare boards in all districts to look after their welfare issues like maternity concerns, children’s education etc. We are also working closely with NGOs in the city and fully support their activities,” he said. Credai president Hemant Naiknavare has acknowledged the work done by NGOs. However, he urged the state government to be more pro-active in extending the benefits to all construction sites. “The mobile or semipermanent crèches and learning centres are an immense help construction labourers’ children who are exposed to not just primary education, but are also taught about hygiene and other important life lessons. Builders pitch in too, not just by giving them monetary help, but by providing sites and shelters for the crèches. Builders also pay 1% of the total cost of construction as a cess to the state government for labour welfare initiatives with which much more can be done for providing educational, dietary and medical help for the labourers and their children,” said Naiknavare.